“The Watermark kids we serve want to know God’s Word and build community into their lives. “I was born near Tampa, Florida,” said Curtis Lane, “but my family moved to Winfield, Alabama – population 6,000. Neither of my parents went to college. My dad began his career washing trucks for the telephone company and worked his way up to become a telephone engineer. While I didn’t have a spiritual foundation growing up, my dad pushed me to ‘do my best or not do it at all.’ I learned to give 110% to whatever I was doing. “Someone in Winfield invited us to church. On my 4th visit, someone asked me what I thought about Jesus. I had no answer, and the other kids laughed at me. I hated being made fun of and decided to dedicate myself to learning more about Christ. “I started bringing my Bible and sitting on the first few rows at church so I could hear stories about the Lord. I learned about having a personal relationship with Christ and began to walk with the Lord when I was in 7th grade. Later, I was baptized and started getting involved in a local youth group. “The county I grew up in had the third highest number of meth labs in the country. Drugs were everywhere and teenage pregnancies were rampant. I was the ‘Christian kid’ in my class at high school. I had a handful of friends who were committed to Christ, but not very many. “After graduation, most of my friends went to work at the local factory or the coal mine. I chose to go to the University of Alabama. Unfortunately, my first year in college, I got immersed into the fraternity and party scene. I got caught with alcohol in my room, and faced the risk of getting kicked out of the dorm. I knew I couldn’t pay for my own housing and was worried I’d end up working in a factory like my other friends. I was devastated and told my parents what had happened. God used that moment to get my attention. Was I going to follow Him or not? I was reminded of all the Lord had done for me, and my life turned around. “God gave me a church to be part of and a group of friends who encouraged me and helped me learn more about God’s love. In the summers, I started serving at Pine Cove Camp here in Texas, where I learned more about discipleship and the importance of working for the Lord’s pleasure rather than serving man. I also started doing inner-city outreach during college. God used both of those opportunities to give me a desire to disciple kids and shape me into the man I am today. 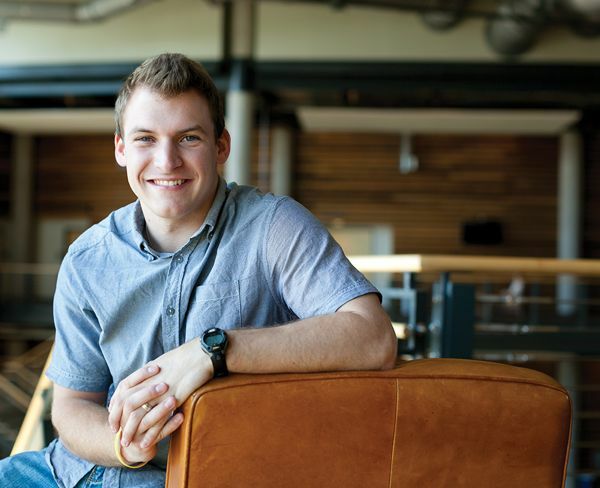 “During my senior year of college, I got my first job in youth ministry. It was a great opportunity. I got hands-on experience in conflict resolution, leading volunteers and supporting families as they parented children. As I got closer to graduation, I was really run ragged. There was a dispute with a parent that made me question what a 20-year-old kid like me was doing trying to lead a youth ministry. The conflict was actually resolved well, and I ended up learning a lot from my failures. God showed me how to lean on Him for strength and revived me as I thought about my future in ministry. “After college, I was engaged to my wife, Haleigh, and moved to Dallas to take part in the Watermark Residency Program. As a Watermark Resident, I take part in great discipleship and in-depth teaching from God’s Word. I also get to learn more about how to be effective in ministry. It’s that training that opened the door to leading Watermark’s Student Ministry at our Fort Worth campus. “What I love about student ministry in Fort Worth is that I can partner relationally with kids who are just getting involved at Watermark. We know everybody’s name because there are 30 kids rather than 300. Wake, our junior high ministry, meets on Sunday mornings in the Ridglea Theater, and our high school students do a Bible study on Wednesday evenings. We have small groups that are led by a great team of young adult volunteers. That’s where the kids are building community with each other. I love these students and their eagerness to follow God and share their faith. “I’m inspired by the kids we serve. I think about Brent, a kid in our Fort Worth student ministry, who shared Christ with a kid from another faith on the school bus one day. Brent and others are interested in what the Bible says about different religions so they can know how to share their faith effectively at school. The post WALKING TOWARD FAITHFULNESS appeared first on Watermark Community Church Blog.